I received this birthday memory from Daniel Kirk the same day I began reading his books to my children. It was fresh in my head when I read them my favorite book of his, Library Mouse. Sam is a mouse that lives in a hole in the wall in the children's department of a library. At night he has the library all to himself and reads as many books as he can. One night he decides to write his own book after recognizing that he has quite an imagination. He is quite pleased with his efforts, an autobiography, and bravely stashes the book on the library shelf with the other biographies. The next day, a young girl discovers the book and Sam observes her joy while she turns the pages. Sam decides to write more books which leads to a request from the librarian in the form of note to meet the author of the wonderful stories that are being left around the library. 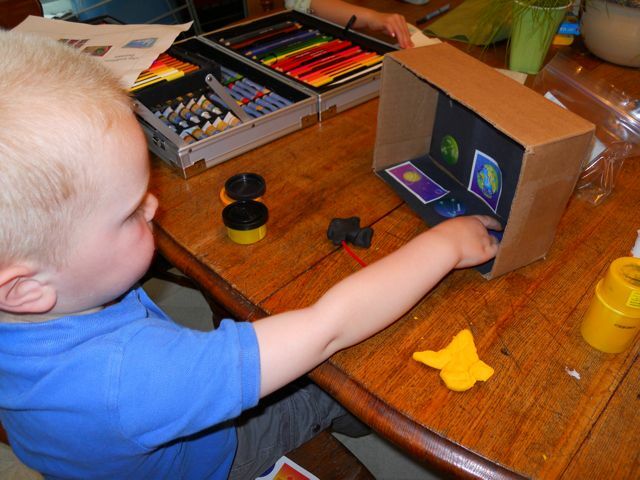 Sam is quite shy and would prefer at this time to keep his nose "buried in a book," but has an ingenious way of sparking creativity in the children's department the next day. To spark creativity this week I presented my children with choices for an activity to celebrate Daniel Kirk's birthday. Normally, it is hard to come up with one activity, but there were plenty of ideas I found while reading through Kirk's biography on his website. I learned that when he was younger, Daniel spent many hours "claying" or making clay sculptures while watching TV. 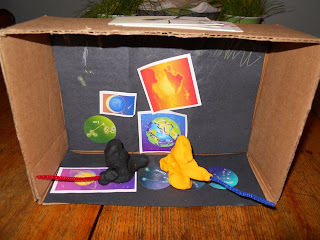 These clay sculptures sometimes found their way into a shoe box diorama (Activity Idea #1 - make a clay sculpture diorama). I also learned that Kirk's parents were puppeteers and performed shows that showcased Mother Goose, Aesop, and Grimm's fairy tales (Activity Idea #2 - make a puppet). My favorite quote from his biography was when he described his childhood, "I didn't really feel complete without a pencil in my hand, and a piece of paper to draw on." He mentioned that he loved making scary monster cards (Activity Idea #3 - make monster trading cards). 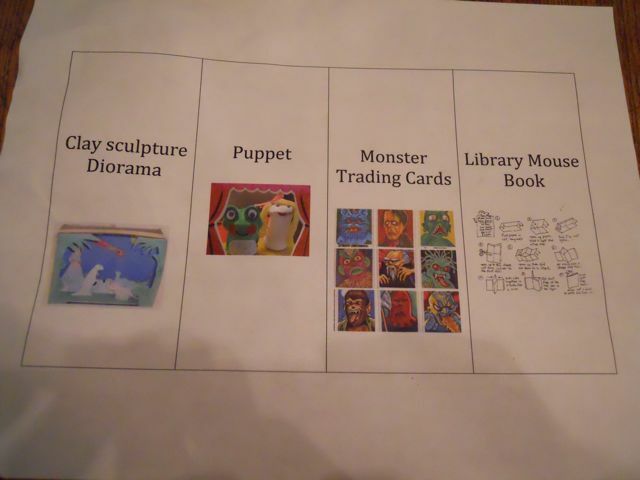 The fourth activity idea was to make a book, like Sam from Library Mouse, using the directions provided on Danielkirk.com. If my children would have chosen this activity I would given them the guidance that Sam used when he started, "Write what you know." I made up activity choice sheet. I then explained the activities to each of them separately to make sure there was no influence on their choice. My son chose to make a clay sculpture diorama. We needed PlayDoh (modeling clay would have required a trip to the store), construction paper, a box, stickers, and a glue stick. My daughter chose to make monster trading cards. I cut cardstock paper into 2.5" x 3.5" rectangles. 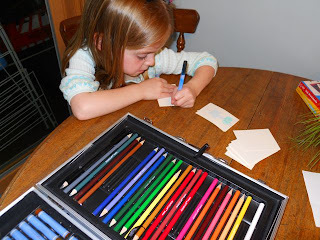 She chose to use colored pencils and a black pen. My son wanted to make a Star Wars lightsaber duel for his diorama. The lightsabers were made with pipe cleaners. 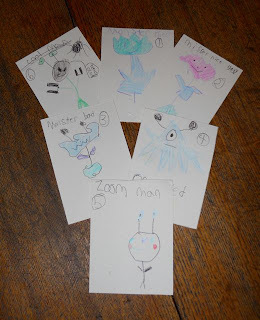 My daughter's monster trading cards were a hit. I had to cut more blank cards for her today. The picture above is from her first batch with characters like Zoom Man -- he is so fast I can't see him and Monster Bad -- he is so mean that I do not play with him. She drew a picture on the front with the character name and on the back she listed the characters color, size, mood, and where it lives. Thank you so much Daniel Kirk for sharing your birthday memory. I appreciate you getting back to me on such short notice. You and your books helped "spark creativity" at our house this week. We hope you have a wonderful birthday! 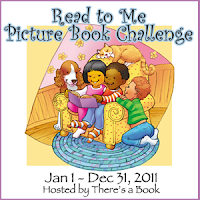 All of these books were added to our list of picture books we have been reading for the Picture Book Challenge sponsored by There's a Book. There is still time to join in on the fun and to have a chance to win some great prizes! Check out the other books we have been reading by clicking here. 1. Daniel Kirk's Website - Plus a great Activity Page + a great biography! I love those activities! I would have chosen to do a diorama...they are so much fun to create!